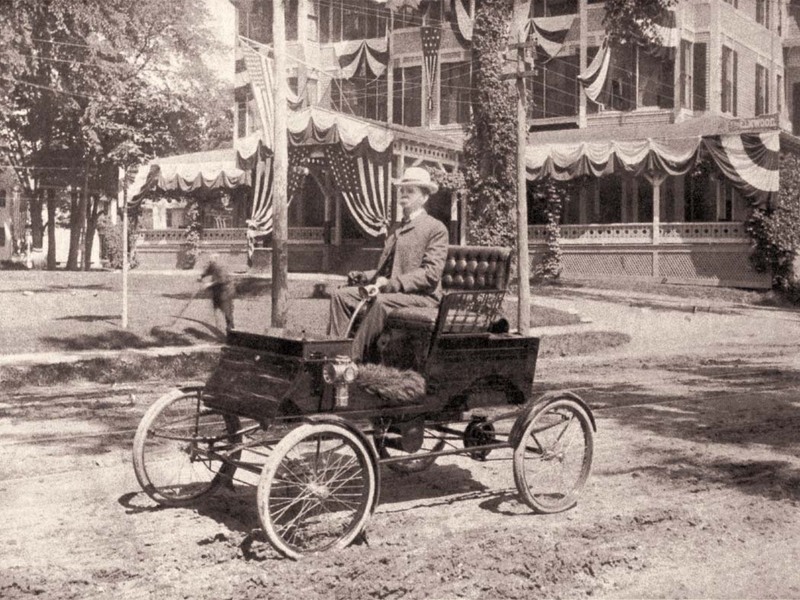 Great-uncle Charles Walter Hussey (1845-) sitting proudly in his Stanley Steamer. Taken about 4 July 1900 in front of the Elm Street Hotel, Waterville, Maine. Family tree last update July 2011 - approx. 2,120 people born before 1911. The descendants of Thomas Nelson (1615-1648) of Rowley Yorkshire and Rowley Mass., are given in a family history written by a descendant in 1868. One of Thomas Nelson's descendants, Marion Carr Hussey, married William Olsen Trenholm of New Brunswick, Canada, in 1916. Her ancestors and cousins are included in this database which contains about 2,120 individuals born before 1911. The index contains about 2,120 people, but **ONLY THOSE PEOPLE BORN BEFORE 1911**. These people are listed in an alphabetical index and displayed in a linked tree format. Source references are given as links beside some of the information in the family tree. For convenience, details of the longer references are also shown in a separate Bibliography. In the source reference file attached to the Family Tree, these references are replaced by a shorter description, beginning with: [Cem.] for Cemetery; [Census] for Census; [Coll.] for other large collections; [FBible] for Family Bible; [FGEN] for Family Genealogy; [I] for information from an individual; [LHG] for Local History & Genealogy; [VS] for Vital Statistics. A link to the Bibliography appears near the end of this page. This information presented here should be regarded as a guide only. It is based on a wide variety of sources, sometimes conflicting, and no claim can be made concerning accuracy. Some but not all of the sources are shown in the detailed family tree. Changes will be made from time to time; new information from readers is welcome, provided the source of the information is also given to assist in resolving differences. Emma Sophia (Nelson) Carr (1848-1938) of Maine, was a founder and President of the Nelson Family Historical Society. Research into the Carr and Hussey lines was conducted by my late father, Melvin Walter Trenholm of Dartmouth, Nova Scotia, Canada (son of William Olsen Trenholm) and his late cousins Robert Dunbar Hussey and Carolyn Mabel (Hussey) Nelson of Maine. Other specific contributions are listed in the source references. NELSON ANCESTOR - start here for Thomas Nelson (1615-1648) of Rowley, Yorkshire and Rowley, Mass. A plus sign (+) means that more descendants are listed in source documents. An asterisk (*) indicates an ancestor of my grandmother, Marion Carr Hussey (1889-1975). A first name in lower case, e.g. "baby john" means the person died very young. "NO CHILDREN" means "NO CHILDREN BORN BEFORE 1911" or "NOT ENTERED IN DATABASE"
Detailed information on some of the sources used for this database. Information for the most frequent references has been moved to a separate file, for easier access. In the Family Tree source file, these references are denoted by short names: [Cem.] for Cemetery; [Census] for Census; [Coll.] for other large collections; [FBible] for Family Bible; [FGEN] for Family Genealogy; [I] for information from an individual; [LHG] for Local History and Genealogy; [VS] for Vital Statistics. Other families in Maine and Mass. Created by Reunion for Macintosh version 5.02 (I do not recommend later versions), from Leister Productions, Inc.